Over the years the Shark Diving Xpert team has come to recognise the unique personalities of the sharks who visit during our trips, and we'd like to introduce you to some of them. The moment his dorsal broke the surface and we saw this unique shredded fin we knew this shark was something special. During our first season at the Island this particular individual was with us on most trips. Almost enjoying all the attention he was getting from our ecstatic divers we began to get to know this animal in a way that we never thought was possible for a great white shark. He displayed a variety of behaviors that we where able to observe in detail time and time again. We began to realize that although he seemed exceptional, every shark that we would go onto meet had a certain unique and individual personality. Big sharks - bigger personalities! Since this first encounter we have gone onto recognize and become fond of many big personalities at the island. Bruce, Lucy, Bella, Biteface, the list goes on an on. Some are bold others are shy. Some are relaxed others can be highly excitable. Being able to show our divers these varying characters and break down the thought that every shark is the same is very important for us. Some divers get to spend many hours in the presence of one of these sharks during the duration of the trip. 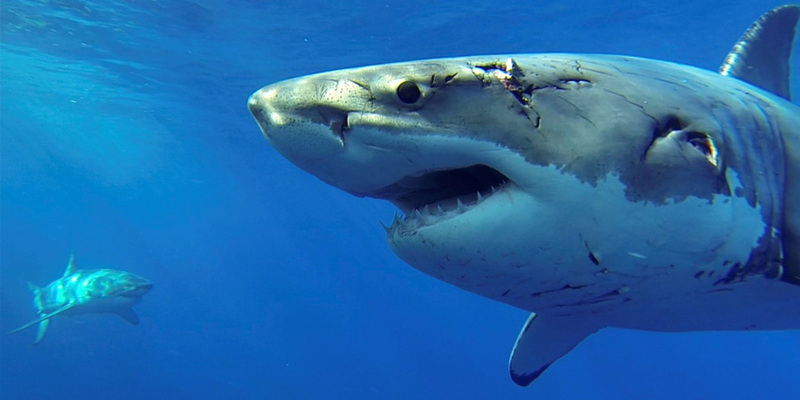 They will stay in contact with us for years to come wanting to find out if that same shark has been spotted again and if we are still seeing him/her regularly. We have profiled 12 of our regular sharks in our sharks pages and as the season progresses we will be featuring regular updates on these animals as well as profiling many more that we have come to know well. Lets face it, they are the true stars of Guadalupe so we though we would share our knowledge on these fascinating creatures with you. If you’re a previous guest that has already met one of these iconic sharks in person or you are a future guest hoping to meet a particular shark, we will keep you updated on sightings and behaviors throughout the season.